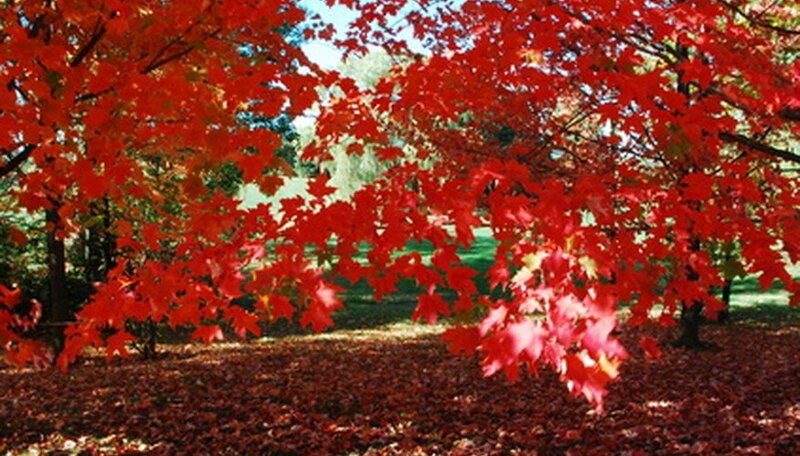 Red maple trees (Acer rubrum) are one of the most commonly found trees in the eastern part of North America, according to the U.S. Department of Agriculture Forest Service. There are many cultivars of A. rubrum that can vary widely in size and appearance. In general, this deciduous tree species is desirable by home gardeners for its spring flowers and especially for its fall foliage, but it can suffer from weak wood. Acer rubrum is somewhat of a fast-growing tree, according to the University of Connecticut. In the wild, it can reach heights of 100 feet. In cultivation, it usually remains around 50 to 60 feet tall. As a young tree, the red maple has a pyramidal shape, which gradually becomes rounded or oval with time. The bark is very attractive and contrasts nicely with the texture of the tree's flowers and leaves. On young trees, it is smooth and light gray, appearing almost silver if the light hits it just right. As the tree gets older, the bark darkens and develops interesting, scaly patterns. The spring flowers, which bloom in early spring (late winter in warmer climates), are small and reddish-orange in color. They show up nicely against the tree's bark. Interestingly, each branch has either male or female flowers. The female flowers are usually more brightly-colored. The leaves are positioned opposite of each other, with either three or five palmate (hand-shaped) lobes, according to Virginia Tech University. In the summer, they are green on top and grayish-green underneath. In the autumn, the trees are one of the first to change color. The leaves become yellow, orange, burgundy or bright red. The latter is the most popular color and the one that is the most cultivated. "Franksred" has a rounded or pyramidal form and is known for its showy red autumn foliage, which develops in late September or early October. "Bowhall" has a wider canopy than many of the other cultivars and has yellow-orange leaves with red margins. "Autumn Flame" is also a rounded cultivar and has smaller, more delicate leaves than many other cultivars that turn red in the fall. U.S. Department of Agriculture Forest Service: Acer Rubrum L.